The general consensus among economic forecasters is that fourth quarter growth will be solid but slower. Some forecasters feel that growth peaked early this year and will slow as we move into 2019. There are a number of reasons, primarily structural, for a slowdown, including sub-par investment spending and slower labor force growth. The Congressional Budget Office calculates our potential GDP and its prospective growth path annually. In simple terms, potential growth (with no inflation) is determined by labor force growth and productivity growth. The dramatic decline in investment and labor force growth in 2008 and subsequent years significantly altered the potential growth of the economy. Each year that actual GDP was below its potential, future potential GDP growth shrunk, as capital spending did not add enough new capacity to increase potential output. In addition, the labor force participation rate fell, so fewer workers became available. Thus, although our GDP growth finally caught up with potential GDP in early 2018, it was at a much lower level of potential growth (Chart 1). The U.S. is at “full employment” now but at a lower level of GDP than was possible in 2007 or subsequent years because capacity shrunk due to low investment, depreciation not replaced, and slow labor force growth. Based on current estimates for labor force growth and productivity improvement (technology and investment), our future growth will be more constrained than it was in earlier years. In the small business sector, investment spending reached 45 year low levels during 2008-2016. Low investment spending depressed productivity growth each year, starting subsequent years at lower potential growth levels. Over the same period, the labor force participation rate declined from 66.2 percent in January 2008 to 62.7 percent in December 2016, a massive reduction in labor supply. Less new investment and fewer workers means that growth will be limited to a lower potential growth rate. Whether we reach those potential growth rates will depend on the growth in spending. Spending, which is supported by increased government outlays, tax cuts, reduced regulatory costs, a lower saving rate, and solid employment gains, has finally eliminated excess capacity. Now growth depends on productivity gains through training and investment in new capital and increasing labor force participation. Reports of unfilled job openings and few qualified job applicants are at record levels on Main Street and at larger firms as well. Owners report raising compensation at record rates to attract new workers. While all of this helps, it will not be sufficient to restore potential growth to the higher levels that were squelched by slow growth and investment in 2008-2016. Small business employs about half of the private sector workforce, so investment (better tools, etc.) and training in that sector are critical to improving overall worker productivity over the next five years. Fortunately, plans to make capital outlays rose from a low of 14 percent of owners in 2009 to 33 percent last August, good news for productivity improvement in the next few years. In the meantime, continued strong demand will put pressure on capacity and prices, keeping the Federal Reserve more inclined to raise interest rates to slow inflation that could emerge. 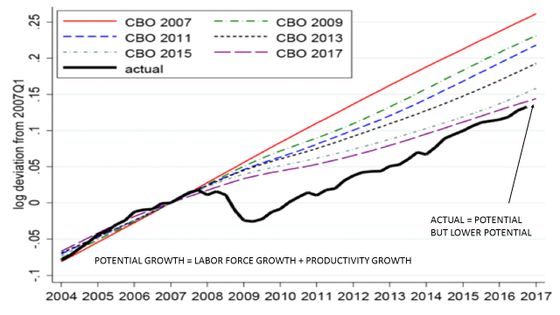 In the near term, our growth rate in real terms will be constrained by the rate of growth of the labor force (about 0.7 percent) and the improvement in productivity (output per person), which depends on investment spending (estimated to be about 1.3 percent). Summed, growth can be about 2.0 percent per year without causing inflation. If spending grows faster than that, prices will rise and the Federal Reserve will respond with higher interest rates to slow spending. Longer term, more investment spending to raise productivity and a faster labor force growth will make it possible for the economy to grow faster without inflation problems.